Mon bébé is a lucky baby. 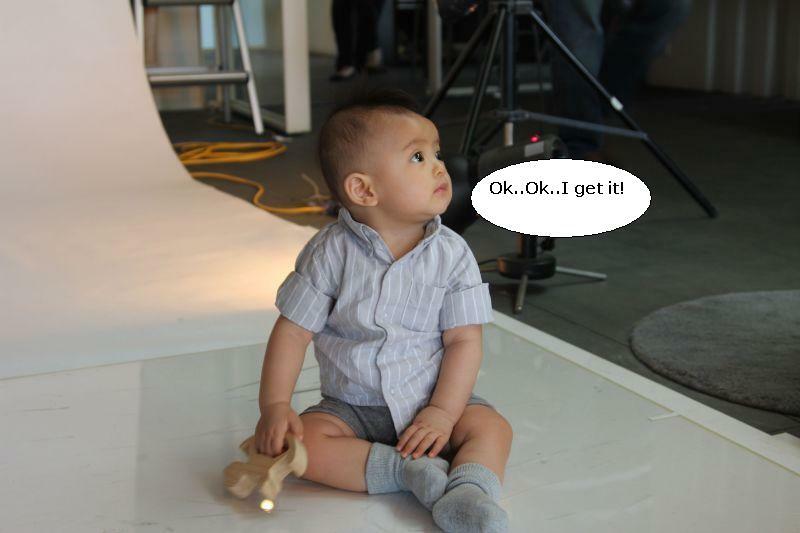 Two weeks ago, mon bébé had his very first photo shoot taken at iF A-Gon’s office. 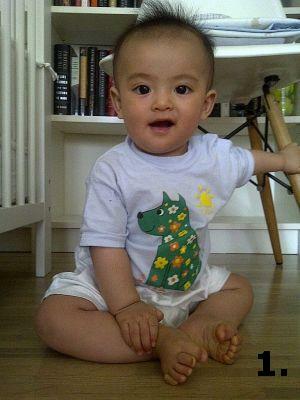 During the photo shoot, mon bébé posed naturally and smiled to the camera from different angles. The photographer was happy with the result. So was I. 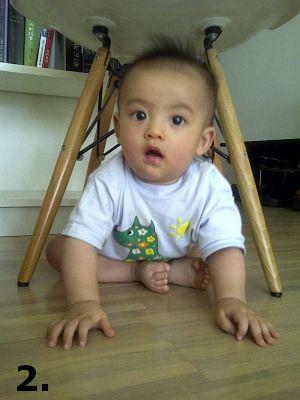 Fashion Tips: Baby Gap white bodysuit, H&M grey stripped shirt, Zara kids grey shorts & Old Navy grey socks. *Most of you got it right, for mon bébé was pooping in the last post. Guess what is mon bébé doing? p.s. The question will be answered in the next post. Fashion Tips: Baby Gap navy blue sleeveless top & Pei-Tou market boxers. 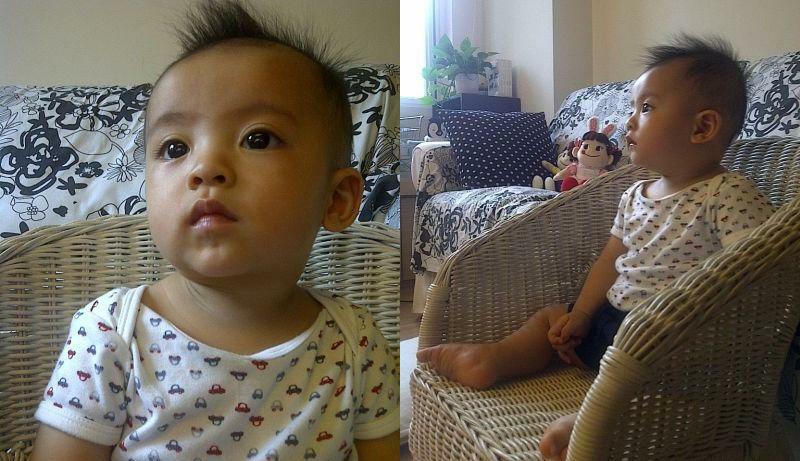 Today, mon bébé visited Xiao-Hu (almost 2 years old) and his one-month old sister. 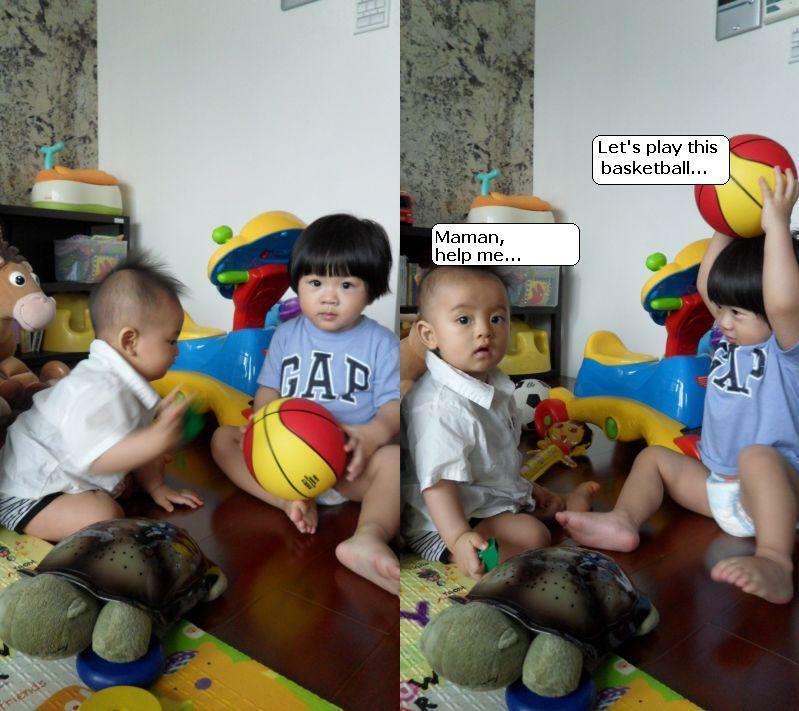 Xiao-Hu is a little angel, for he shared generously his toys with mon bébé. 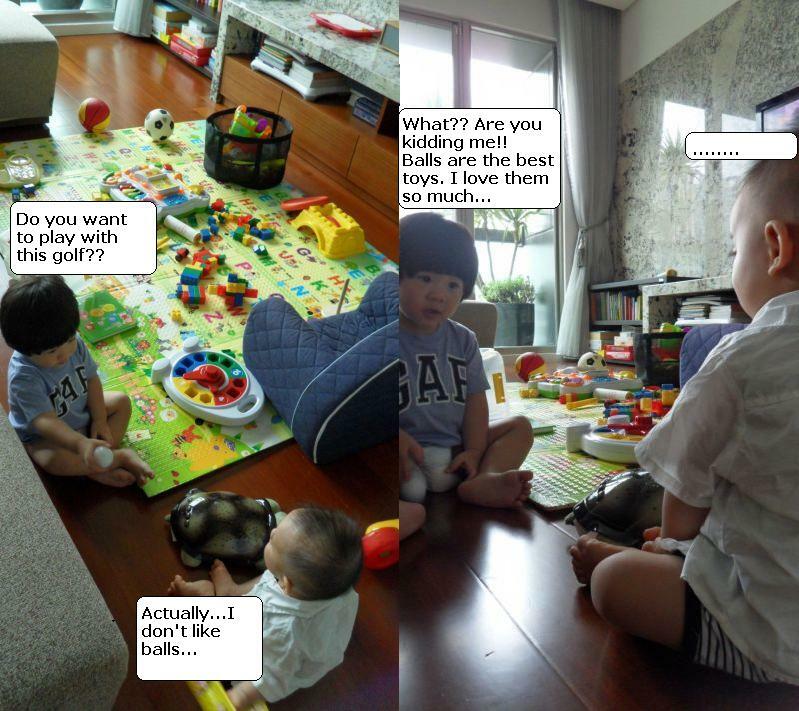 Mon bébé was so amazed by Xiao-Hu’s toy collection that he didn’t want to go home. Fashion Tips: http://www.24028.jp stripped one-piece & Ralph Lauren Shirt. 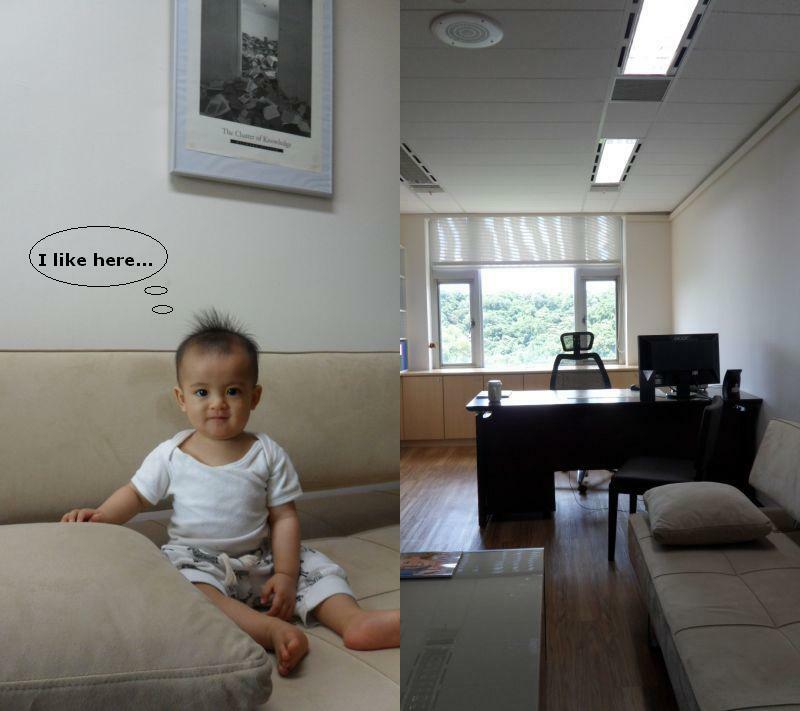 Today, Papa took A-Ma & mon bébé to visit his office. 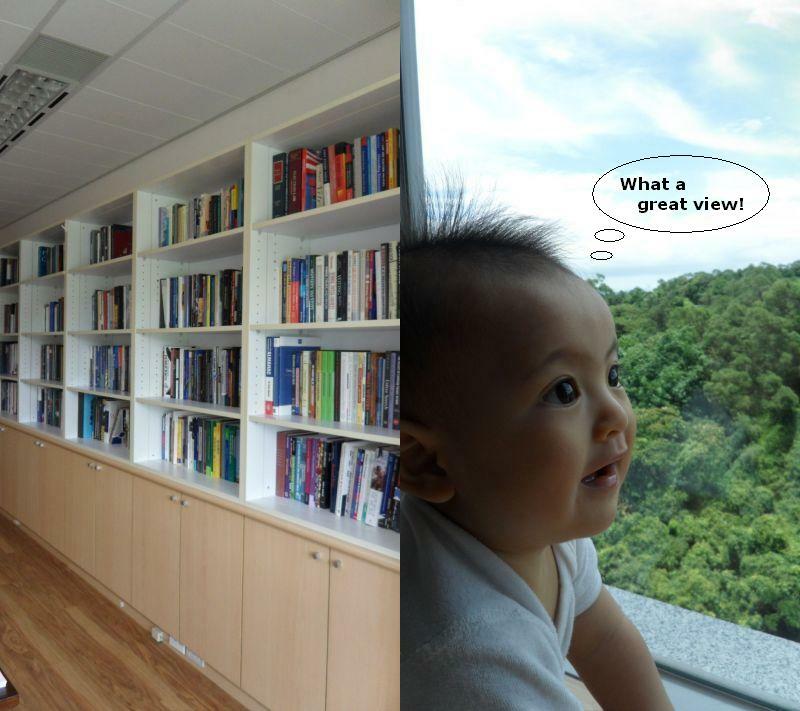 The office has a long wall of bookshelves, a comfy sofa bed, a large desk, and a great green view. Mon bébé is excited by everything and is happy to be there. Fashion Tips: www.24028.jp white bodysuit & black/white zebra pants. Mon bébé likes to watch TV, just like papa and maman. Everyday mon bébé gets his 15-minute TV time to watch his favorite “Chio-Hu” (巧虎) episode. As you can see, mon bébé is watching Chio-Hu with full attention, even though he has been watching the same episode for more than 20 times. Fashion Tips: Carter’s bodysuit & Baby Gap shorts. Taking care of a baby is not that difficult. 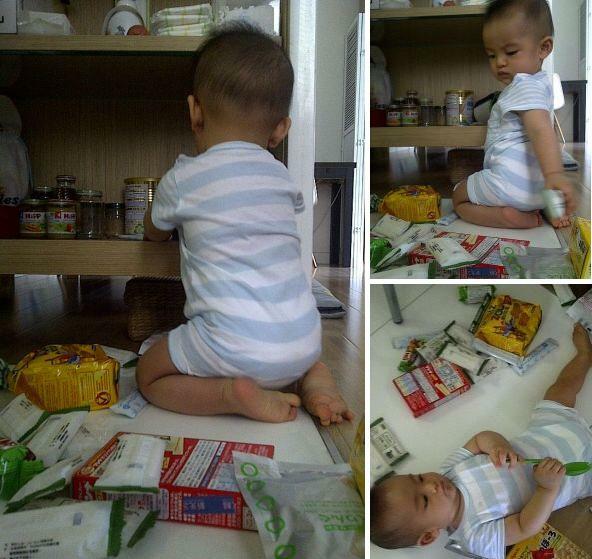 For me, the most weary part is to clean everything mon bébé destroyed all the time, without enough sleep. Fashion Tips: http://www.24028.jp white/skyblue stripped summer one-piece. 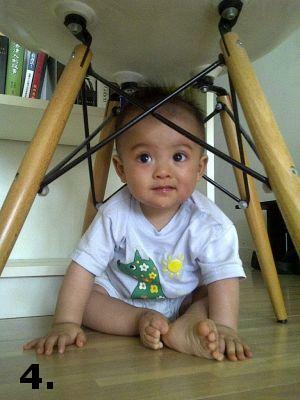 Today mon bébé is going to show you a few yoga moves for babies. 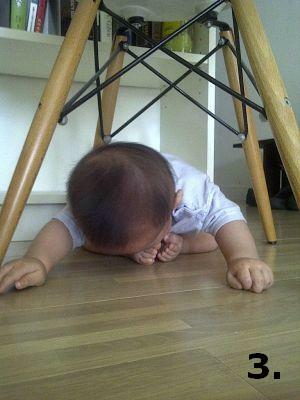 Beware that these poses are safe and easy to do only for 6-8 month old babies. For illustration please see the following pictures. Don’t foget to breath during the exercise! Fashion Tips: Guggenheim museum t shirt & Pei-Tou market white boxers.